Dale Powers sent this classic picture in. 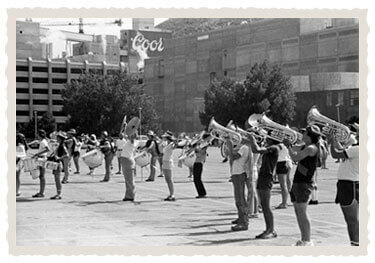 This picture is of the Defenders of Rockland, Mass., in 1978 practicing in the parking lot of the Coors brewery in Boulder, Colo. The corps was in the top 20 for the last three years of their existence before folding at the end of 1982. I had the pleasure to march and teach this corps, and to this day I still have friends I made while I was with "Rockland."